It’s no secret that we’re obsessed with rainbow hair (have you seen the new watercolor trend?) but us brown-haired beauties haven’t been able to capitalize on the trend as easily. Sure, oil slick hair had a moment — a coloring technique that made darker hair appear iridescent, much like the opal hair trend for blondes — but it still wasn’t as satisfying as some of the bright, more mermaid-y options out there for lighter locks. 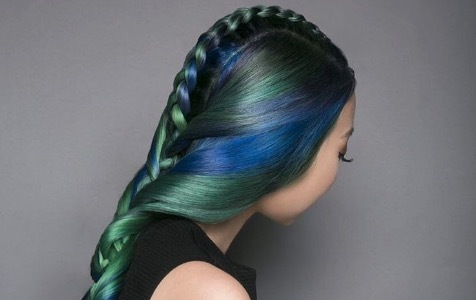 Enter jewel-tone hair, the latest trend that’s guaranteed to turn brunettes into rainbow-haired goddesses. Created by the stylists at Pravana, an innovative hair-care company that’s always cranking out new brightly colored looks, it takes its brilliant hues from the palette of precious gemstones — so think amethyst, emerald, and blue topaz. In the following video, you can watch stylist Erica Keelan paint on the vivid jewel-tone hues with balayage techniques to create a multi-tonal look. What’s interesting is that she alternates shades horizontally, rather than coloring individual streaks. The result is a luscious, bright amethyst with streaks of blue and green peeking out. It’s absolutely gorgeous. The jewel-tone color looks like you could see it in the dark! Other women have run with the jewel-tone trend, to amazing effect. Hair inspo from gemstones? It’s genius.